Car Key Replacement and Auto Locksmiths Hertford, Ware, Harlow, Bishops Stortford, Sawbridgeworth, Stanstead, Stevenage, Cheshunt and Hoddesdon by Access Denied, offers car key replacement for all makes of vehicles. We pride ourselves on our work and have a mobile setup including all the equipment needed for car key replacement. Choose Access Denied, Hertford, Ware, Harlow, Bishops Stortford, Sawbridgeworth, Stanstead, Stevenage, Cheshunt and Hoddesdon & Auto Locksmith Services. If you’ve misplaced your car keys we will be able to replace them for you with no hassle. Our dedicated team of Expert Auto Lock pickers will get to you in no time at all. Our team will Pick the lock of your vehicle without causing damage so you may regain entry. We have a qualified team able to reprogram any new car keys to your car if locks/keys have to be replaced and this can be done at the same time as replacement. Somebody else going to be using your vehicle? Or just need a spare set of keys in case of emergency? We are happy to provide spare keys for any automobile. Car key damaged or snapped off in the lock? We can repair any broken keys as long as you have the plastic casing and components. If it’s snapped in the lock we can carefully remove that also. If any parts are missing the key can still be repaired but may take longer. If you’re looking for emergency auto locksmiths, you’re in luck. At Access Denied, we are proud to offer a range of emergency auto locksmith services. We understand that problems with locks often occur without any warning, which this can leave you stressed and with nowhere to turn. Luckily, we’re always on hand to help. If you run into a problem with the lock on your vehicle, you can count on Access Denied. At Access Denied, we understand that a lot of problems with an auto lock can cause panic. After all, without a fully functioning lock, how are you supposed to leave your car securely parked? Plus, if you’re locked out and can’t get in, how are you supposed to get to work or to collect the kids from school? Simply, a problem with an auto lock is a huge inconvenience. However, that doesn’t mean that the problem can’t be solved efficiently. In fact, there are very few auto lock problems that can’t be solved within a matter of moments. With the right experience and knowledge, a quick solution is always possible. When you run into a problem with your car lock or car key, you’ll need to contact an emergency auto locksmith. As a team of expert emergency auto locksmiths, we are able to quickly assist you with a range of different problems. This includes broken car key replacement, replacing a missing car key, helping if you’re locked out and even gaining access to a car when the key is locked inside. Though all of these problems are very different, we have the specialist tools and equipment to fix things every time. When you run into a problem with a car lock, you shouldn’t have to worry about whether or not you’ll be able to find an emergency auto locksmith. A lot of these issues need to be fixed urgently and don’t see the point in waiting. This is why we are always ready for action. Regardless of where you are or the time of day, there’s always an emergency auto locksmith at Access Denied who can help. Plus, as we offer a mobile locksmith service, we can be with in record time. There are a lot of different auto locksmiths to choose from, but how many can offer you a 24 hour auto locksmith service? At Access Denied, we know that problems with auto locks rarely happen at a time that’s convenient. This is why we work hard to provide a round the clock service to all of our customers. After all, there’s nothing stopping a problem occuring in the middle of the night. Regardless of time and location, you can count on us. At Access Denied, we’re well aware of the stress and worry that having an auto locksmith problem with can cause. However, this is something that’s only heightened if you’re faced with the problem in the middle of the night or very early in the morning. In fact, you’ll probably find yourself feeling at a bit of a loss and helpless. Luckily, you don’t need to worry. As a 24 hour auto locksmith, we’re able to help you out whenever you need us to. Whether it’s 11pm on a Friday night or 4am on a Monday morning, we can send an emergency auto locksmith to you. As we are made up of a team of highly skilled auto locksmiths, we’re able to offer an unmatched service at all times. All of the auto locksmiths are Access Denied are experienced and knowledgeable about auto locks and car keys, which means there’s rarely a problem we’re unable to fix. It is because of this that we’re so confident in our ability to provide the very best auto locksmith to all of our customers. Often, a problem with a car key or car lock will happen when you’re out and about. This could be at the local supermarket, at work or even at a friend’s house. As well as being a 24 hour auto locksmith, we’re also completely mobile. So, regardless of where you are, we can be with you in a matter of moments. All you need to do is get in touch, let us know what the problem is and wait for us to arrive. It really is that simple. You may not have ever been faced with a broken car key, but it’s a problem that many vehicle owners encounter. There are a number of reasons as to why a car key can end up broken, perhaps it has snapped off in the lock or it has become dented over time. Whatever the reason, you’ll need a broken car key replacement. This is where we come in. As professional auto locksmiths, we are able to offer broken car key replacement services to all of our customers. Regardless of car make and model, we’re on hand to help. Though car keys are made to be durable and strong, this doesn’t mean they’re incapable of breaking. In fact, a lot of people find themselves with a snapped car key or one that just isn’t doing the job. This may initially seem like a big problem, but it doesn’t have to be. Thanks to our specialist equipment and expertise, one of the Access Denied auto locksmiths can fix the issue. A broken car key can cause a range of different problems. For example, without a working car key you won’t be able to drive to work. Similarly, without a working car key you won’t be able to collect the kids from school. In fact, you won’t be able to go anywhere. This is why it’s important for a broken car key replacement to happen as soon as possible. After all, you’re going to want the problem solved immediately. This is why it’s vital to choose an emergency auto locksmith that’s able to complete the job quickly, effectively and with professionalism. Without the correct knowledge and tools, it’s near enough impossible. However, at Access Denied we have everything ready and waiting to go. So, whenever you need a broken car key replacement, all you need to do is let us know. At Access Denied, we always strive to provide our customers with an unmatched service. When you choose us, you’re guaranteed an auto locksmith service that goes above and beyond what’s expected. You don’t need to settle for anything other than the very best. Though everyone always try to keep their car keys safe, sometimes they go missing. This could be because you’ve put them down and walked away, it could be because you’ve dropped them whilst out and about, it could even be because they’ve been stolen. Whatever the reason for being without your car keys, it’s important to contact a professional for a lost car key replacement as soon as possible. After all, without a car key, you can’t use your car. Not only is this a huge inconvenience when it comes to travelling from A to B, but it can also put a huge halt on the productivity of your day. In fact, a lost car key usually sends a day into chaos. Luckily, help is at hand. 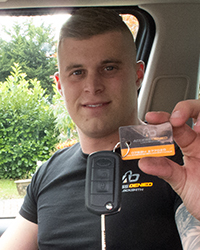 At Access Denied, we are often approached by customers who need a lost car key replacement. As expert auto locksmiths, this is something we’re able to offer. Thanks to our state of the art equipment and fantastic range of tools, we are able to create brand new replacement car keys quickly. Not only does this mean you’ll be able to use your car again soon, but it also cuts down on the amount of time you’re left stressing and unable to get on with your day. We understand that car keys can go missing at any time; perhaps you’ve lost your keys at the supermarket or you’ve misplaced them at a friend’s house. In these situations, you’ll be glad of our mobile service. Instead of having to worry about leaving your car and finding another way to get home, you can relax and let us come to you. One of our highly skilled auto locksmiths will be able to create a lost car key replacement then and there. When it comes to finding an auto locksmith, look no further than Access Denied. At Access Denied, we provide emergency auto locksmith services throughout Hertfordshire. This includes Hertford, Cheshunt, Sawbridgeworth, Hatfield, Bishops Stortford, Welwyn Garden City, Ware, Stevenage, Hoddesdon and Harlow. Plus, all of the surrounding areas. To find out more about our auto locksmith services or for more information on the Access Denied team, get in touch. Contact us today on 07534 277020 or via the online contact form. This is not a problem and is the most common reason we get calls. Our non destructive methods of entry mean we can open your car in no time at all. Call us now for a call out in as little as 30 minutes. Access Denied Auto Locksmiths can provide new keys for your car created to the highest of standards again within as little as 30 minutes. Our fully trained team are 24 hour emergency locksmiths so you can get to us when you need to. Our Auto Locksmiths will always be prompt and professional regardless of the time of day that you call on them. Access Denied have trained staffs in Hertford Auto Locksmiths, Harlow Auto Locksmiths, Bishops Stortford Auto Locksmiths, Stevenage Auto Locksmiths, Hoddesdon Auto Locksmiths, Sawbridgeworth Auto Locksmiths, meaning a member of the team is always within 30 minutes of reaching someone when they call. We will never make you wait longer than necessary to help you out.